Summer is a great time to get out of the studio and refill my creative well. For me, that means getting out into nature, taking hikes, and enjoying the neighborhood flowers. Currently, I’m on a road trip with my eldest daughter. While passing through Asheville, we took the opportunity to visit Chihuly at Biltmore, an exhibition featuring multi-media artist Dale Chihuly’s monumental glass sculptures. The exhibition is set throughout areas of the Biltmore House, gardens, and grounds. The gardens, in particular, make the perfect backdrop for Chihuly’s style — it’s organic, flowing, and gorgeous and seems to come from nature itself. If you have a chance to see the Chihuly exhibition, it’s well worth the time for just the gardens alone. Also open at night, the exhibition sparkles with the light from the colored sculptures, reflecting onto the vegetation. It’s an enchanting sight reminiscent of a magical fairyland. Don’t forget to get your tickets in advance especially for the evening viewings as they limit the number of viewers and it does sell out. With my creative well filled to the brim, how will I use this inspiration? In addition to Chihuly’s brilliant sculptures, I was enthralled by the lily pad pond. All those overlapping oval and circles, and the variety of colors and shapes got my creativity flowing. 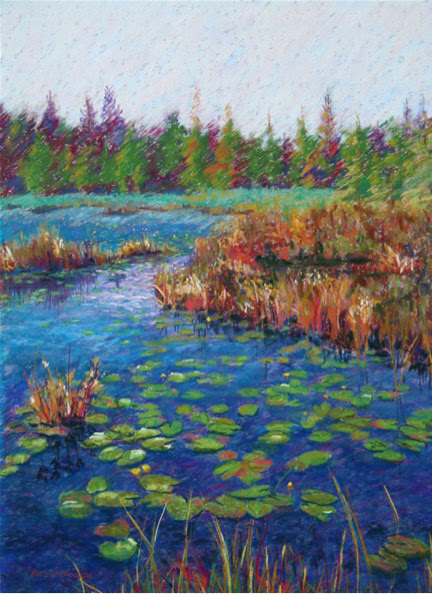 I have painted lily pads in the past (Lily Pad Lake, 23″ x 17″, pastel on paper, $800) but my realistic look has changed to a more abstract style. I took some photos and will use their inspiration to develop some new paintings. Stay tuned. What have you done to fill your creative well this summer? Please share your inspirations and stories with me.